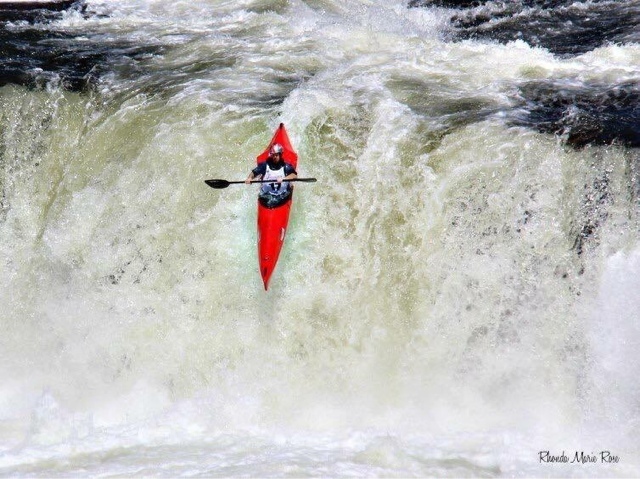 OVER THE EDGE ~ OHIOPYLE FALLS RACE. by Bobby Miller | DBP MAGAZINE ONLINE The World's Best Free Whitewater Publication. Nestled in the western corner of Pennsylvania lies Ohiopyle, a town centered on the biggest waterfall on the Youghiogheny River, Ohiopyle Falls. The falls is an 18 foot sheer drop with a tricky slide approach and a massive boil at the bottom. 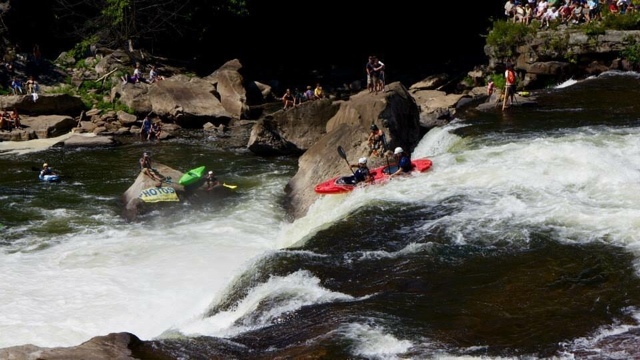 For years, this falls remained illegal to run but, through the negotiations of American Whitewater, it was opened up for paddlers in 1998. 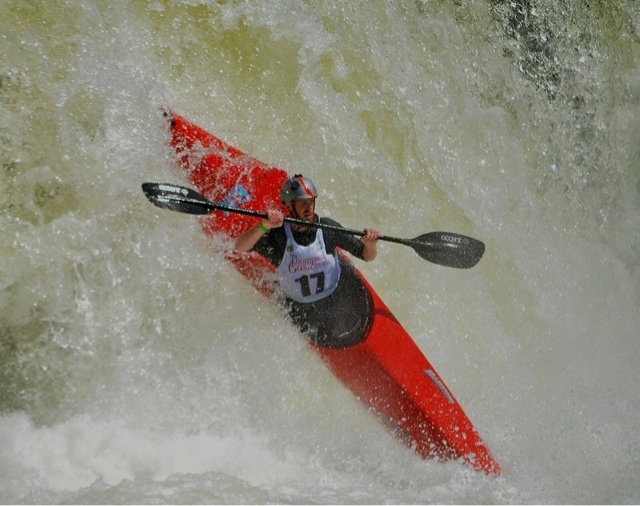 Every year, paddlers come out for this day when you can freely run the falls for a few hours and compete in the race and freestyle event. The race course features three rapids, all of which have tricky elements to add some challenge to racing fast. The first drop has a vicious horseshoe hole that refuses to let anyone out once it has you in its grasp. The second drop is a fun 6 foot boof with a shallow landing that has dished out some painful pitons for those who have blown their boof stroke. Finally, a fast slide with a pesky hole/curler combo leads to the lip of the falls. The boil is massive, sending the flow in multiple directions, including into a cave behind the curtain. 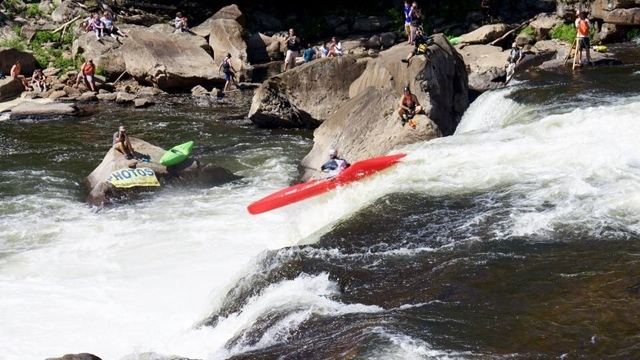 Despite the potential dangers that each rapid presents, large amounts of paddlers come out to Ohiopyle Falls day to test their mettle on the most famous drop in the region. After getting in some practice runs in the morning, I had my lines down and was ready for the race! I paddled my Wavehopper for my longboat attempt and hoped for a lightning fast run. I charged out of the gate, hitting the first horseshoe ledge on the left of center. I cleared the hole and cut left for a straight shot through the second rapid. This wavy section is not the fastest line but it skips around the shallow landing of the 6 foot ledge in the middle. I cut back to the middle through some shallow water to get to the main slide at the falls. I came off a little further right than I wanted but landed well and paddled hard to the finish. My lines were solid and I was definitely pleased with my run. While walking back up, a paddler mentioned to me that it was faster to stay left when coming into the falls and take a line that drops you into the main tongue halfway down. I thanked him for the recommendation and decided to apply this to my short boat run. I was paddling my brand new Liquid Logic Braap, which is very speedy for a short boat. I used the slicy stern to launch over the top hole and then nail the boof off the shallow 6 footer. I hammered across to the left line and found the current carried me much quicker over to the falls. I reconnected with the main flow a little upstream of the falls and launched a big boof to get over the boil and hit the finish line quickly. The race is followed by the freestyle event, where paddlers perform tricks as they go down the approach slide and off the falls. There were several spectacular runs with many cartwheels. I was very impressed with the control that these boaters showed in executing these maneuvers. The awards ceremony later that night was a lot of fun with a great band and a chill atmosphere. Pat Keller took first place overall in the race with Jake Greenbaum and I finishing in a second place tie. Ian Van Wingert and Mike Moore tied for fourth in the race. I took first place in the short boat division, with Ian Van Wingert in second and Sebastian Tosatto and Steve Aycock tieing for third. Adam Johnson and Caleb Adams took the top spot in the tandem class, probably the most difficult class to compete in! The top three women were Maggie Snowel, Brynn Benson, and Lara Voytko. Finally, the winner of the freestyle was Pat Keller, with Adam Johnson in second and Isaac Hull in third. For more information and results, please visit www.fallsrace.com. Thanks to Barry Adams for putting on another great event this year! I can’t wait until next year’s festival! This one is from Donald Howdyshell. My wife Melissa Miller took this one. Here is one more my wife took of Adam Johnson and Caleb Adams in my Topo Duo. Photo at beginning shot by Rhonda Marie Rose. THROWBACK THURSDAY & DBP MAGAZINE ONLINE presents: Spotlight on anOriginal Dirtbag River ~ THE GAULEY.